Nowadays, 8 Ball Pool is a very trending game on phones. It is mostly played in foreign countries and also popular in India. It comes for both Android and iOS operating systems. But here, today I am going to show you how to play Official 8 Ball Pool Online on a computer (Laptop or Desktop). On the computer, the game works smoothly and gives a great playing experience on a bigger screen. Firstly create an account for 8 Ball Pool from here, you can create a new account on Miniclip or either you can use your facebook account for sign up. You can also play as a guest, which will temporarily generate an ID for playing the game if you delete or reset the app you will lose the access to that temporary account. Prefer signing up with Facebook so that you can access your 8 Ball Pool account anytime. After signing up go to this link and log in with your Miniclip account or click on Login With Facebook, if you have signed up using Facebook. And here you can play the game easily, use your mouse to control the game. Playing 8 Ball Pool on a computer is very easy, its easy to control the game also with a bigger display you can enjoy the game. A fast internet connection is also required for playing the game smoothly. If you have signed up for 8 Ball Pool using facebook then you can also play this game from facebook dashboard. 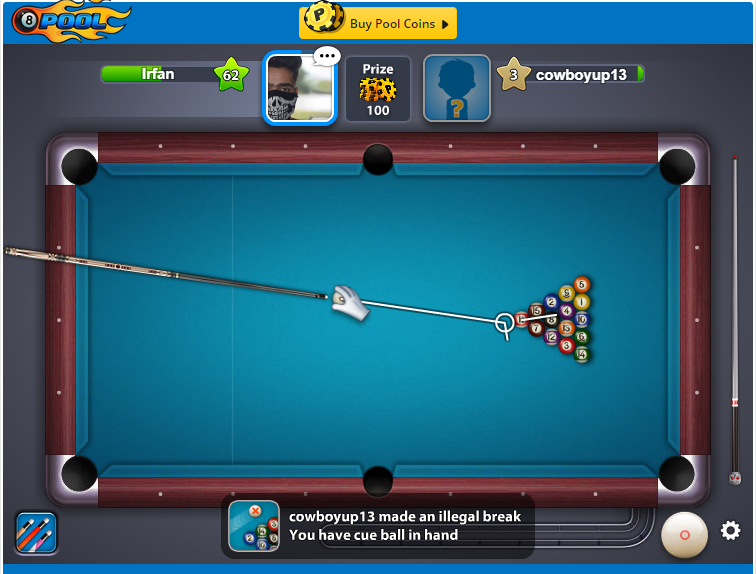 Here are some screenshots of 8 Ball Pool on a PC.